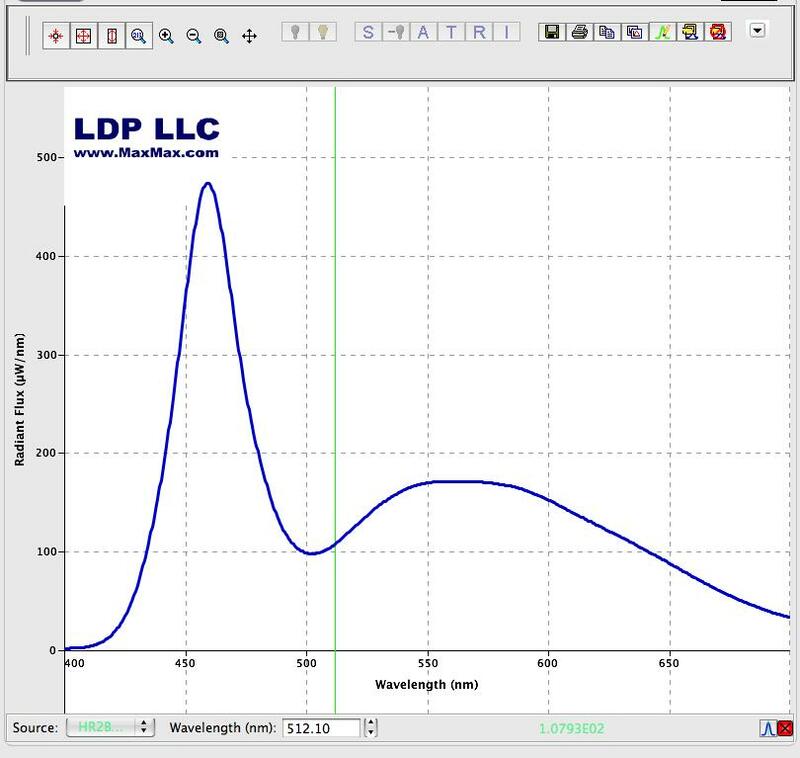 These flashlights are single precision LED lights where the LED's have been measured with a spectrometer and light integration sphere. 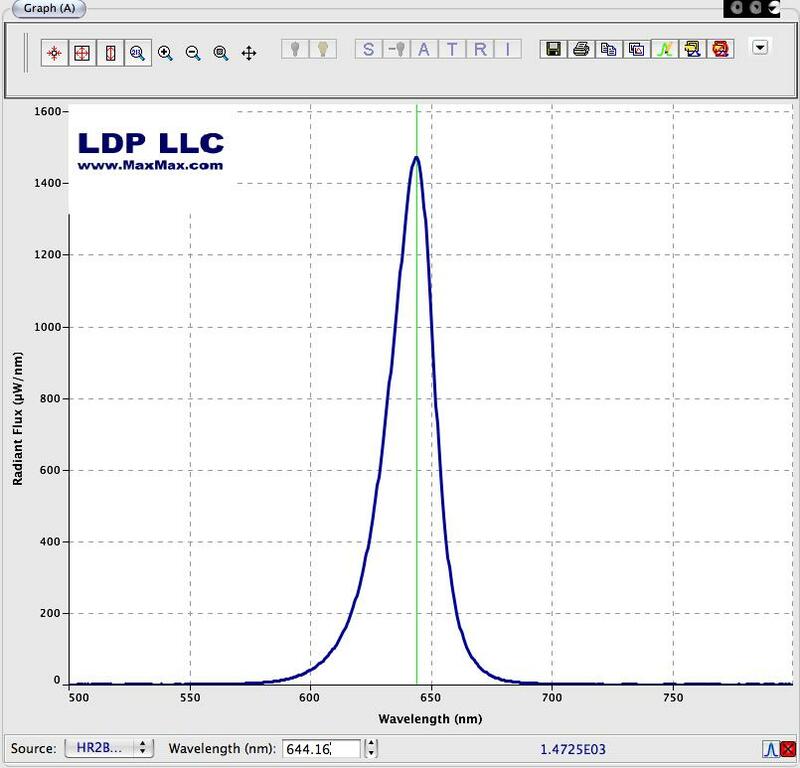 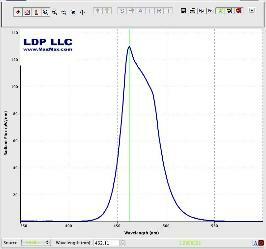 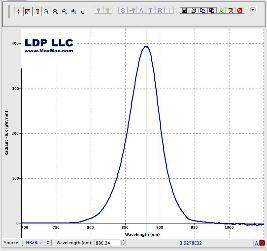 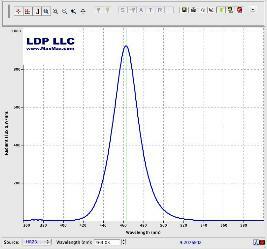 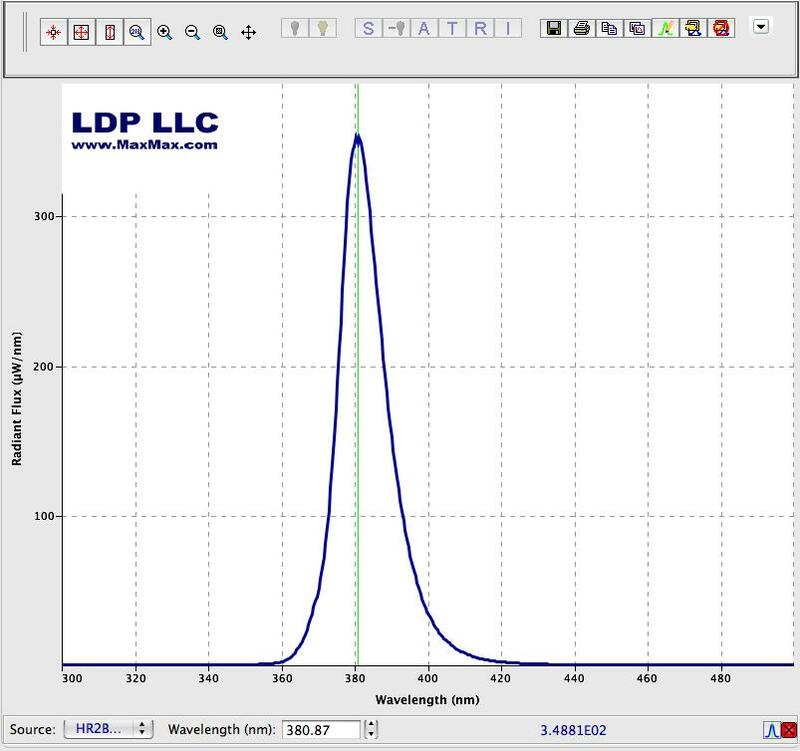 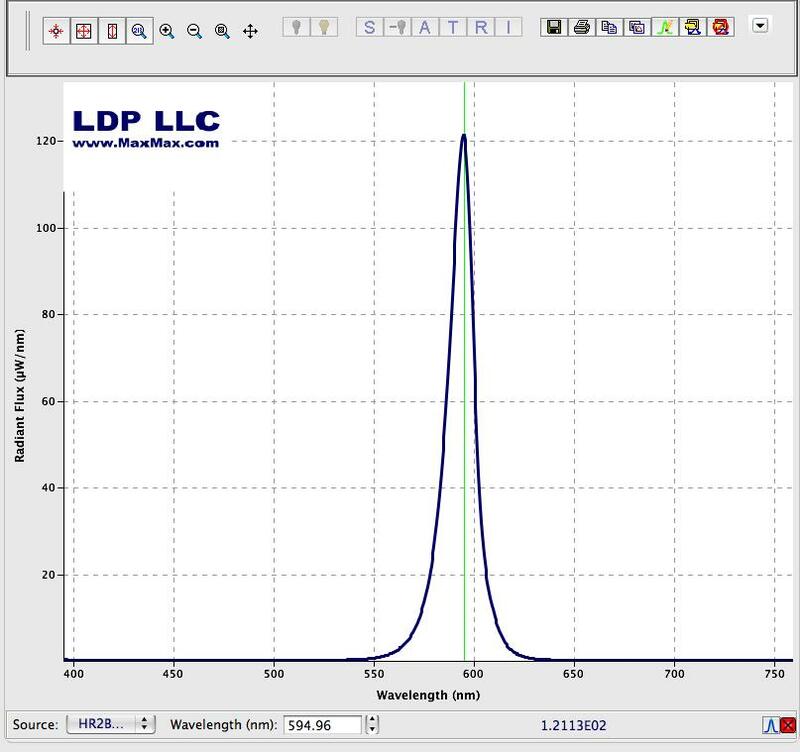 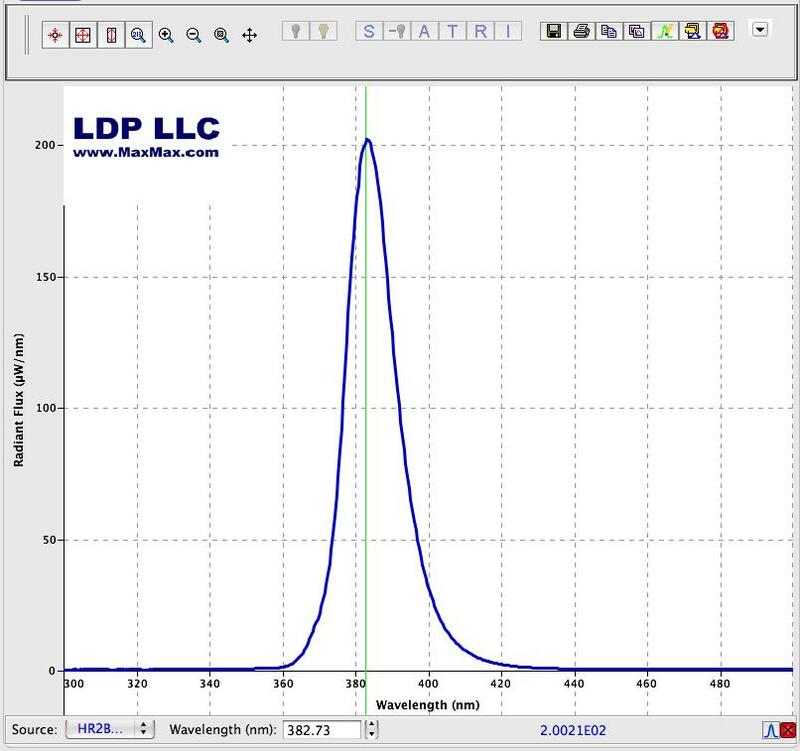 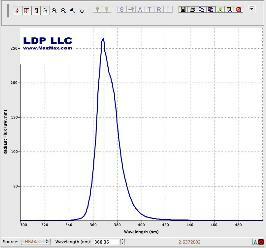 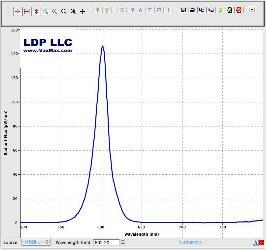 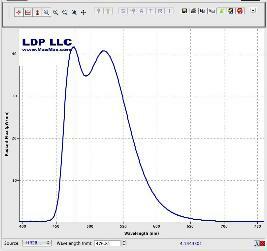 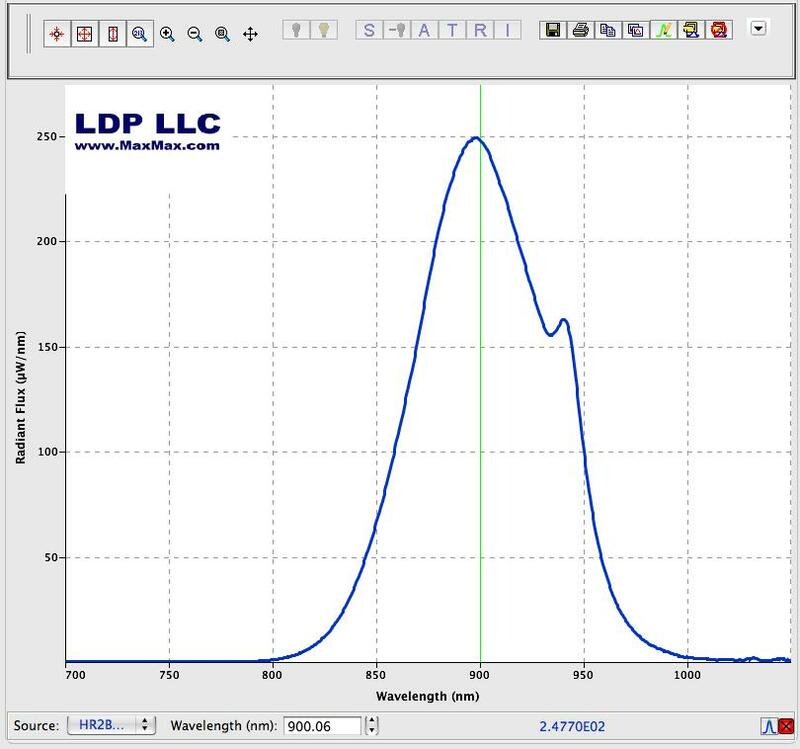 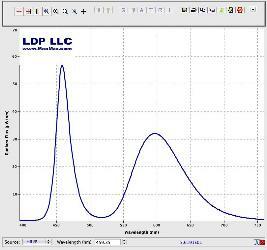 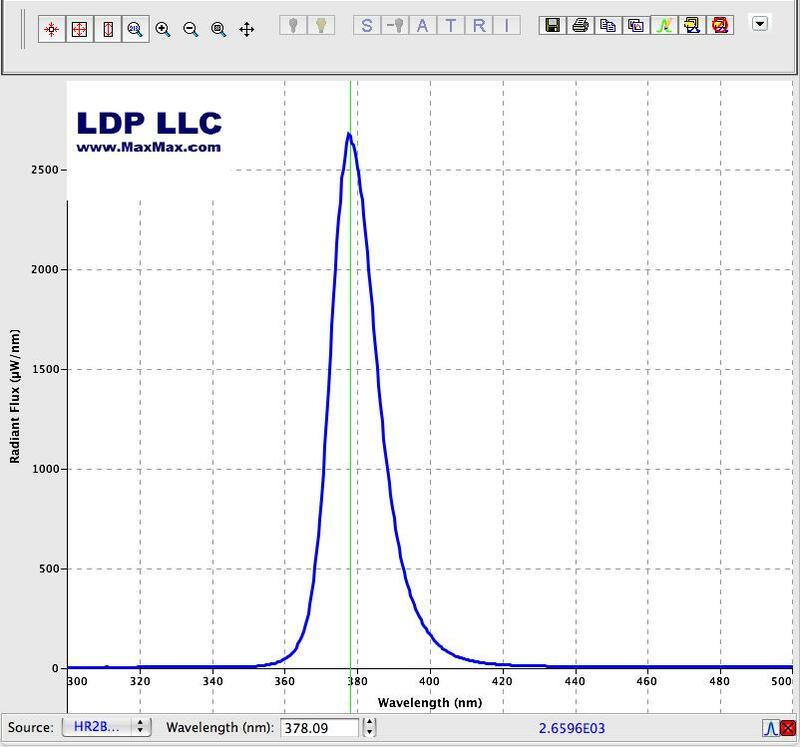 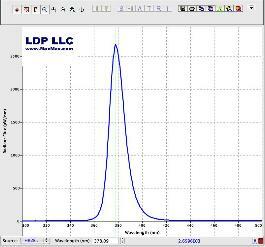 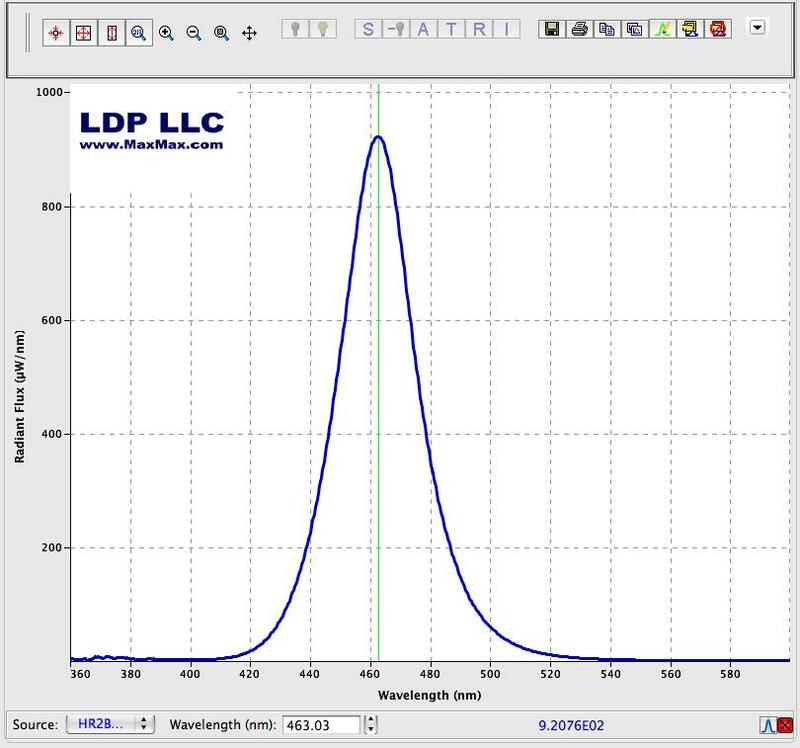 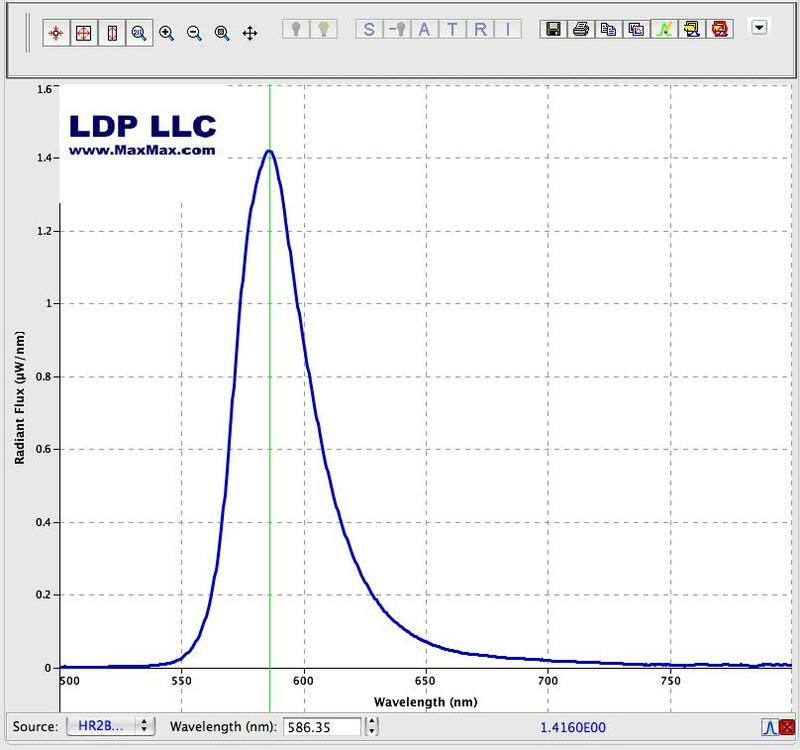 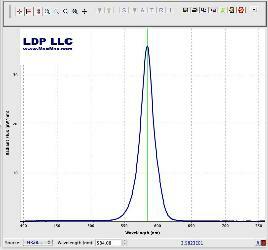 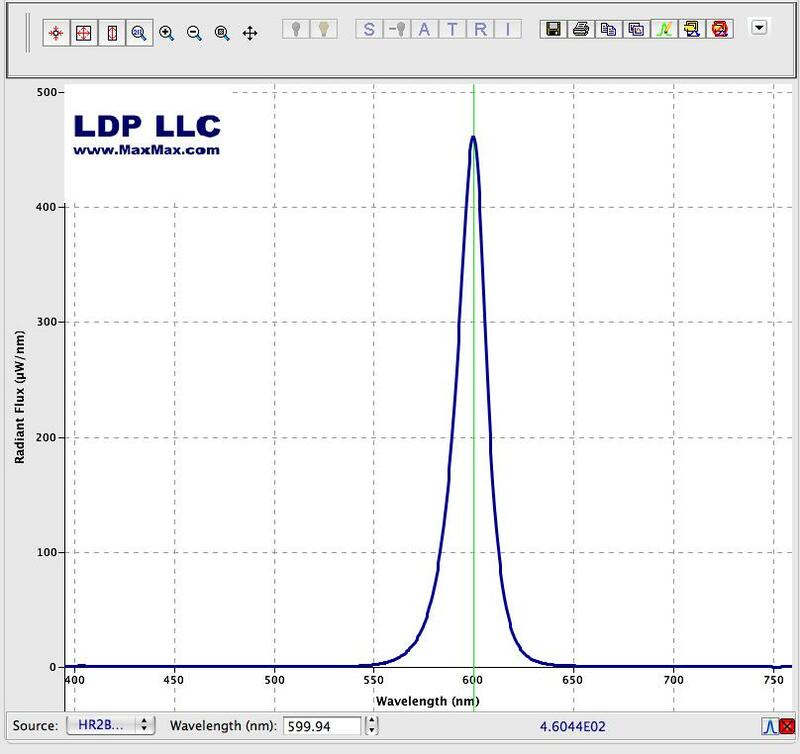 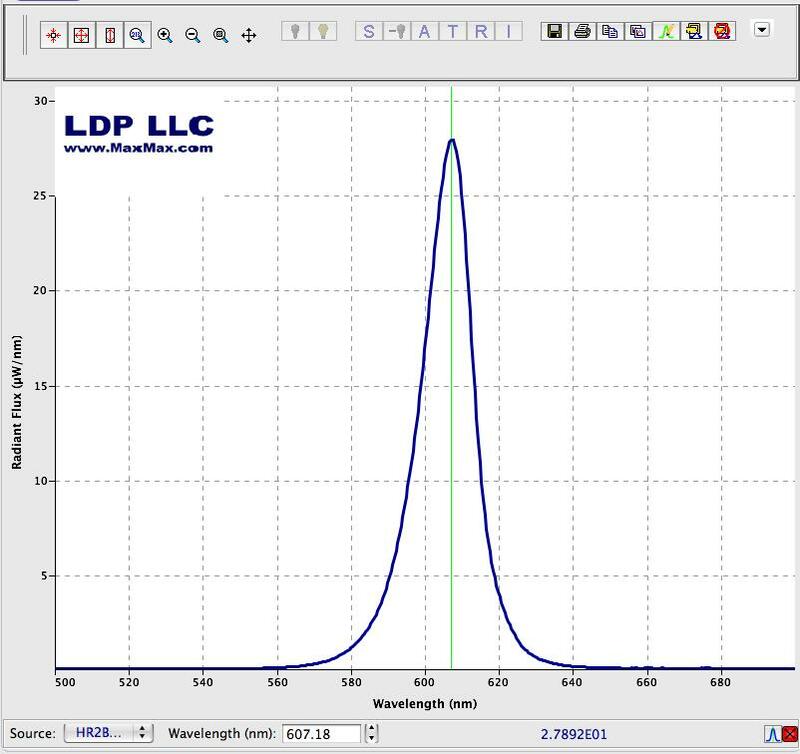 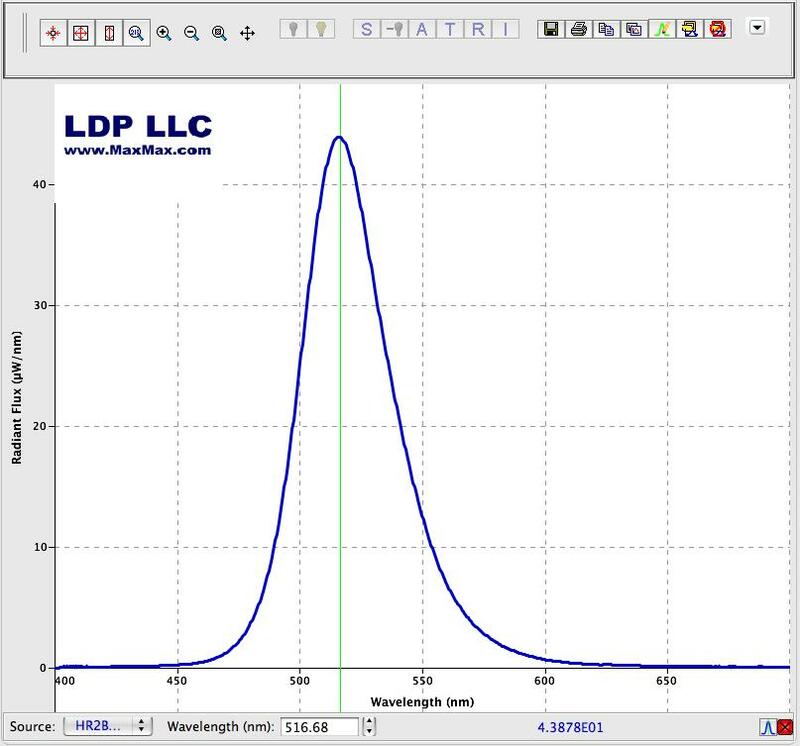 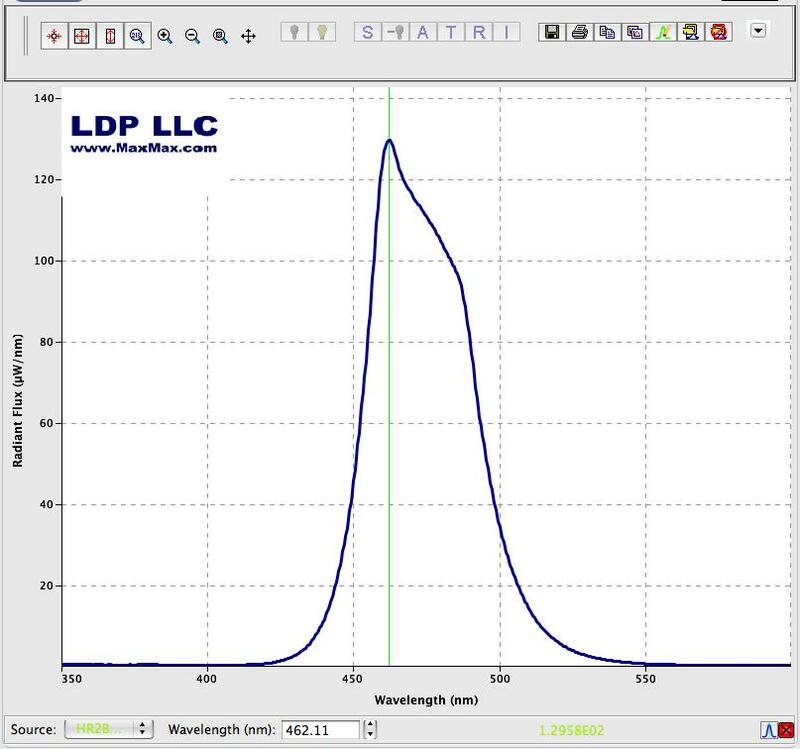 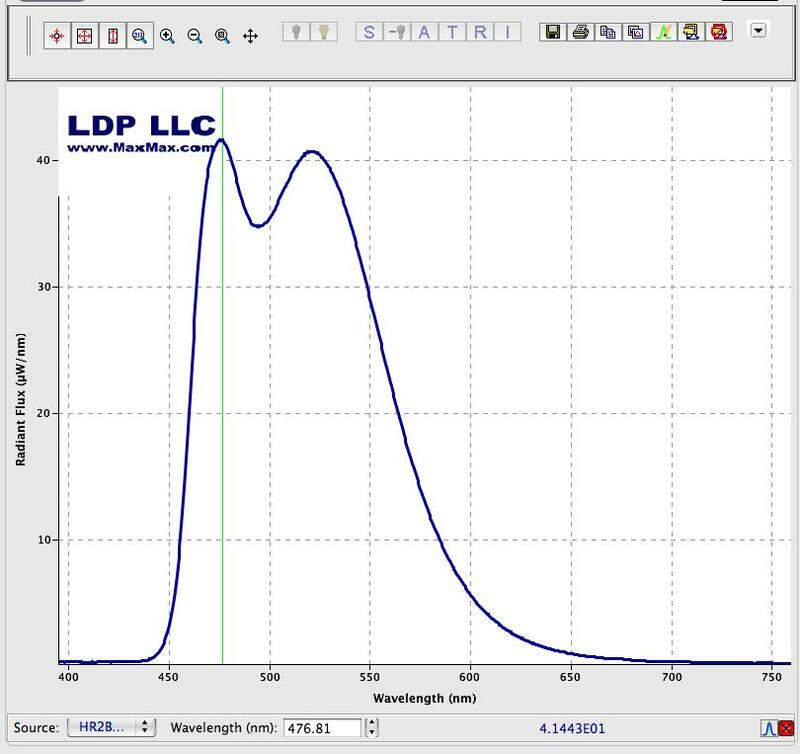 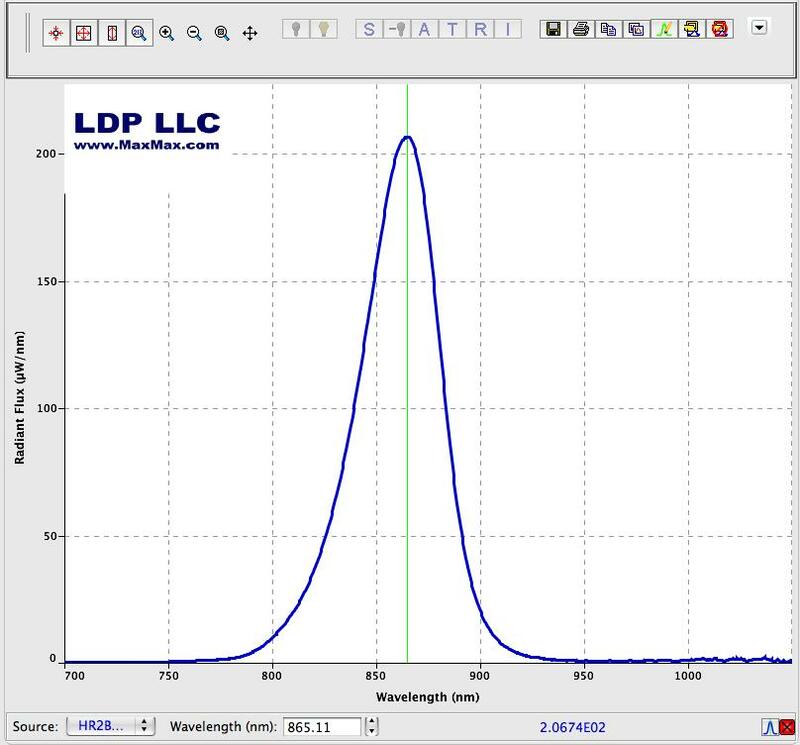 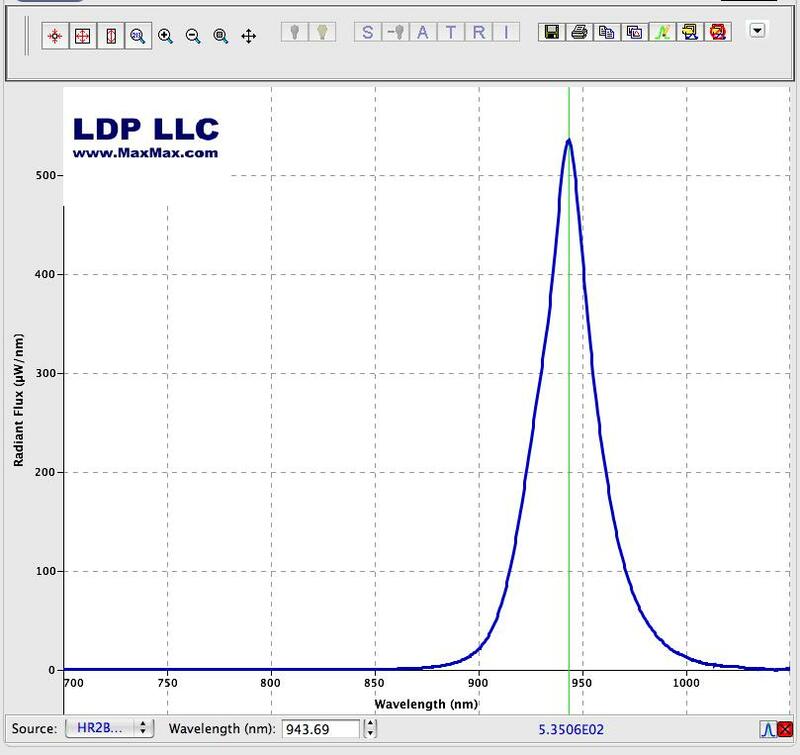 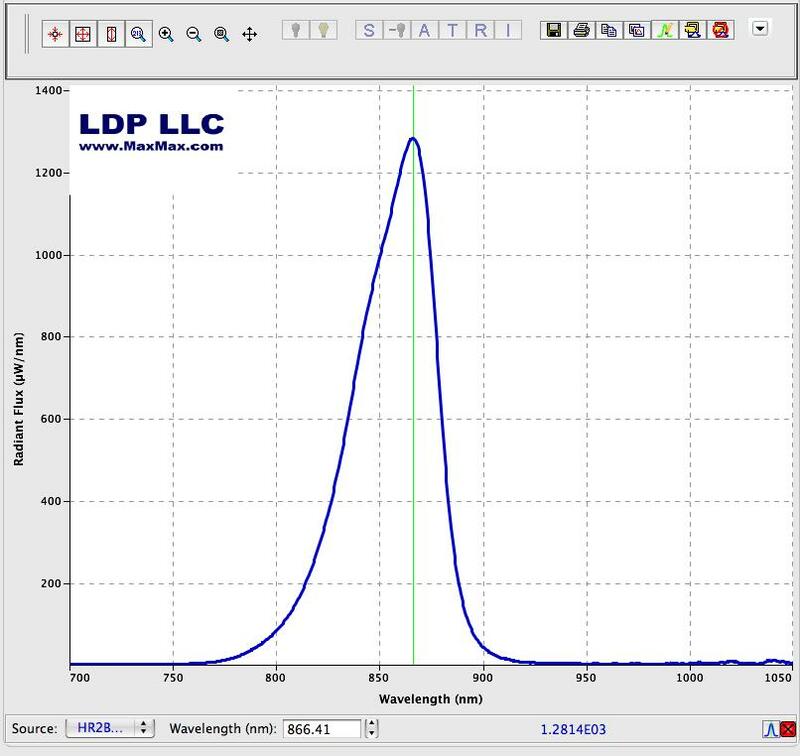 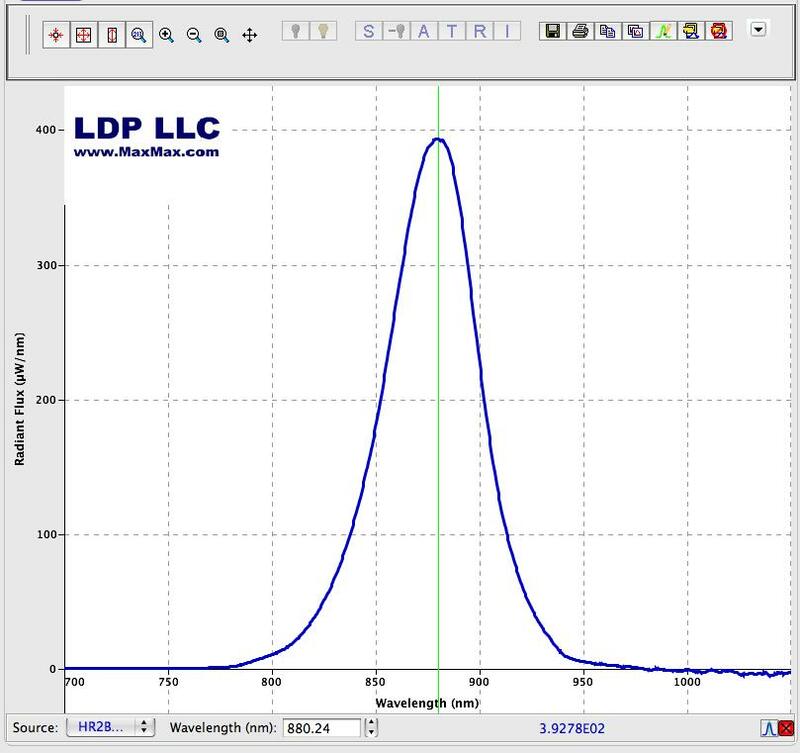 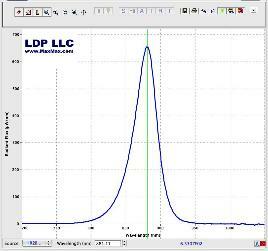 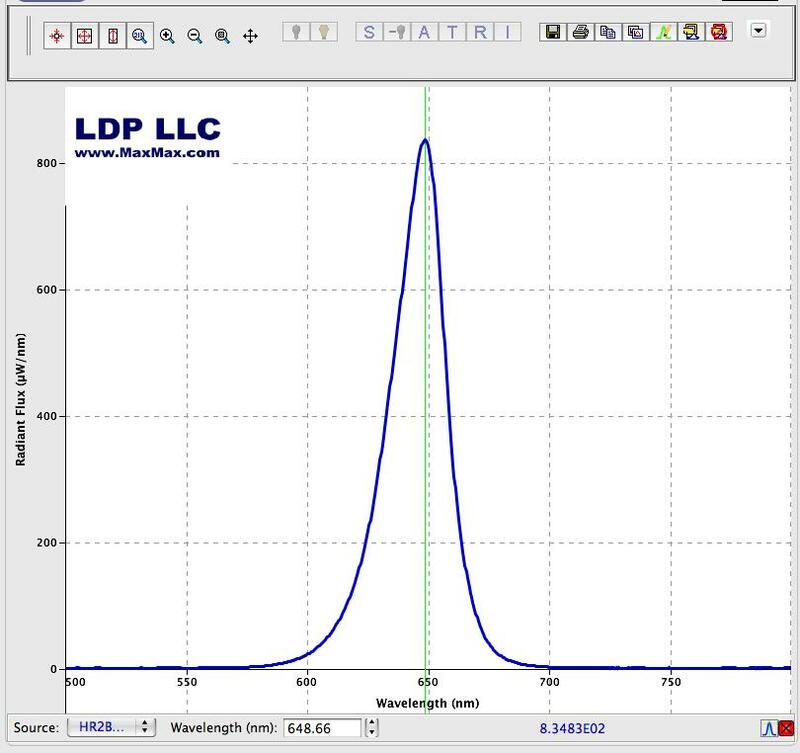 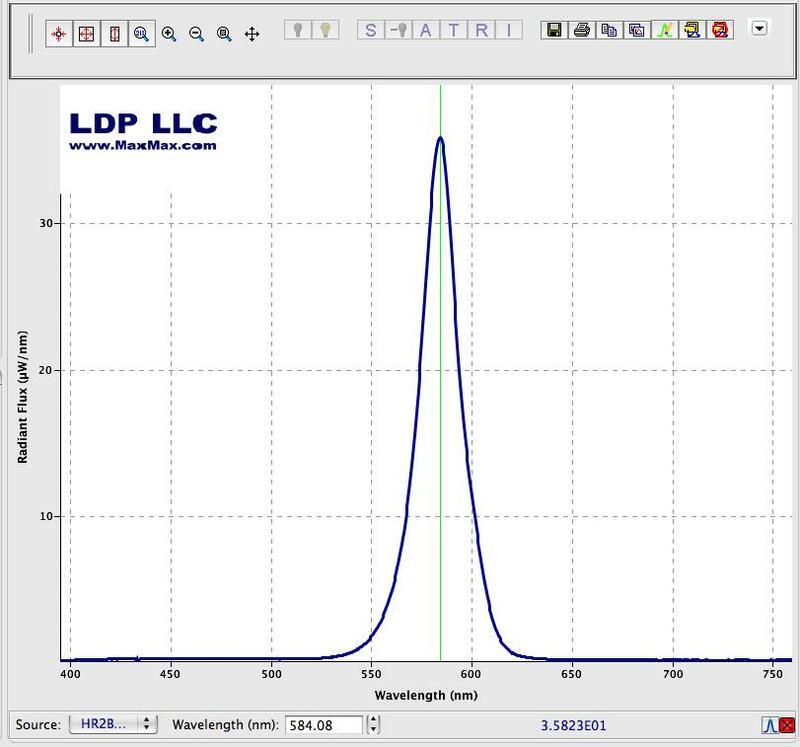 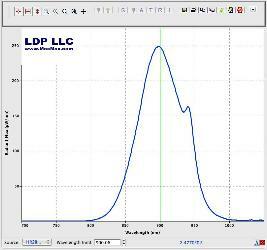 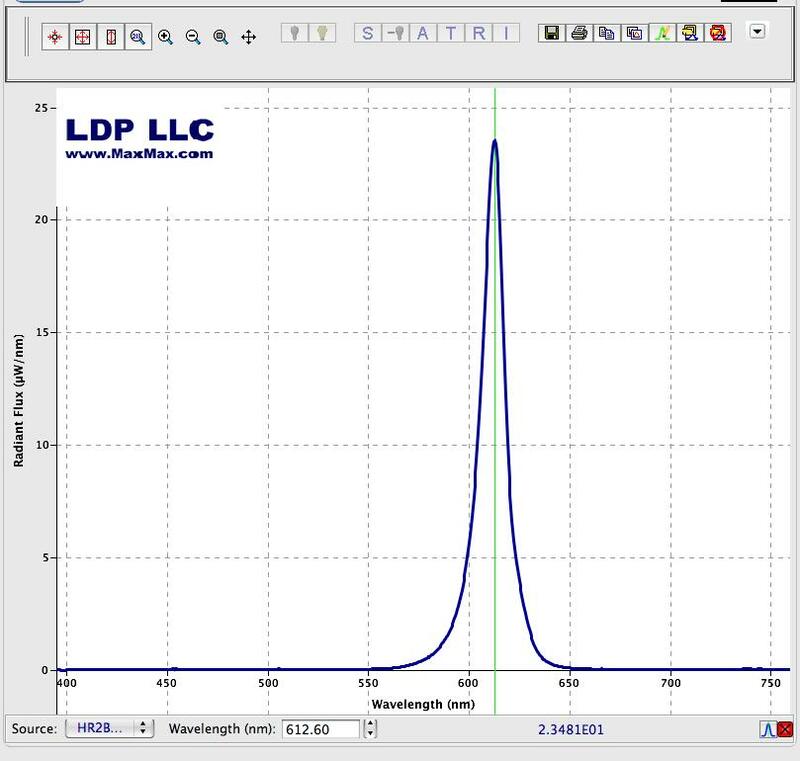 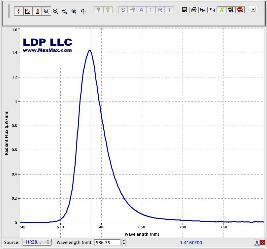 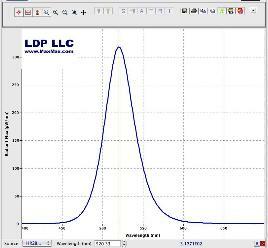 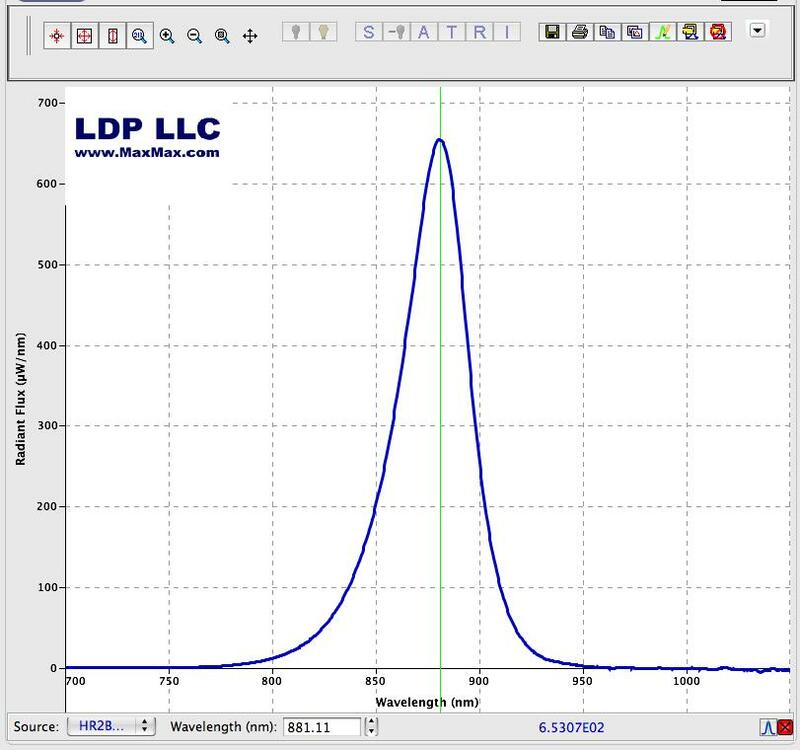 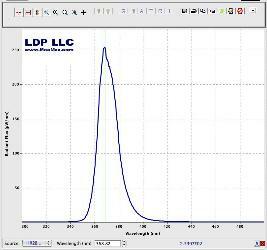 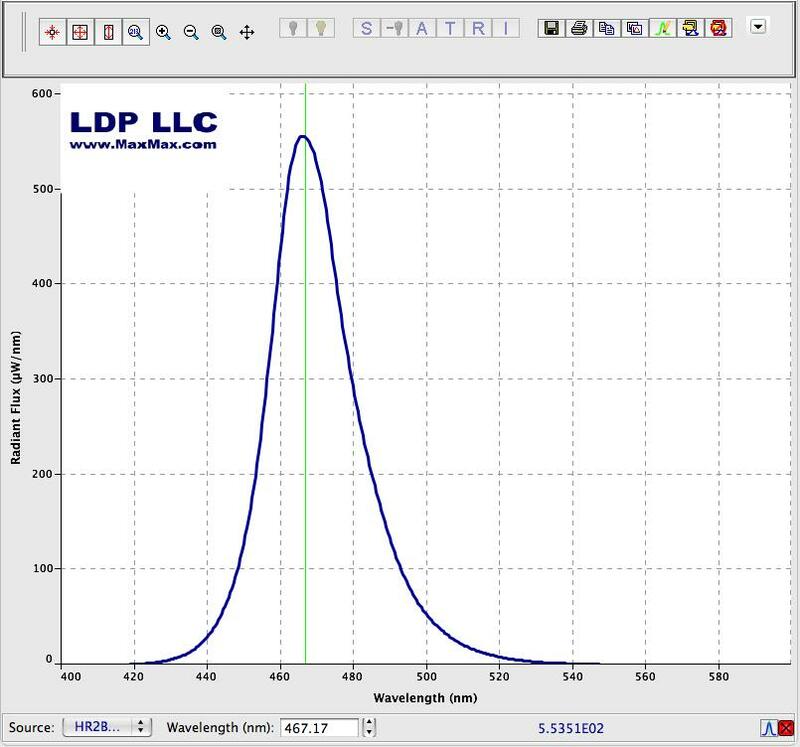 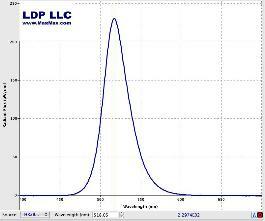 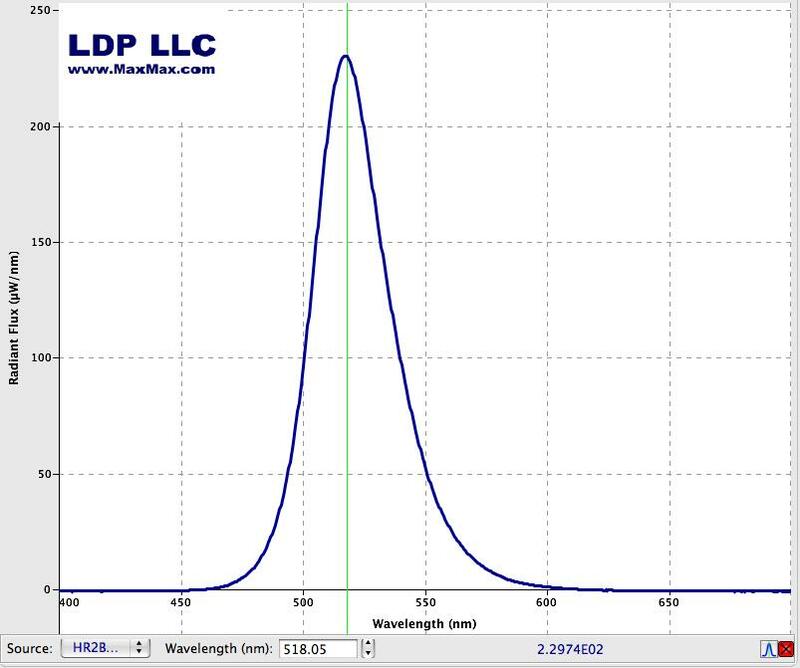 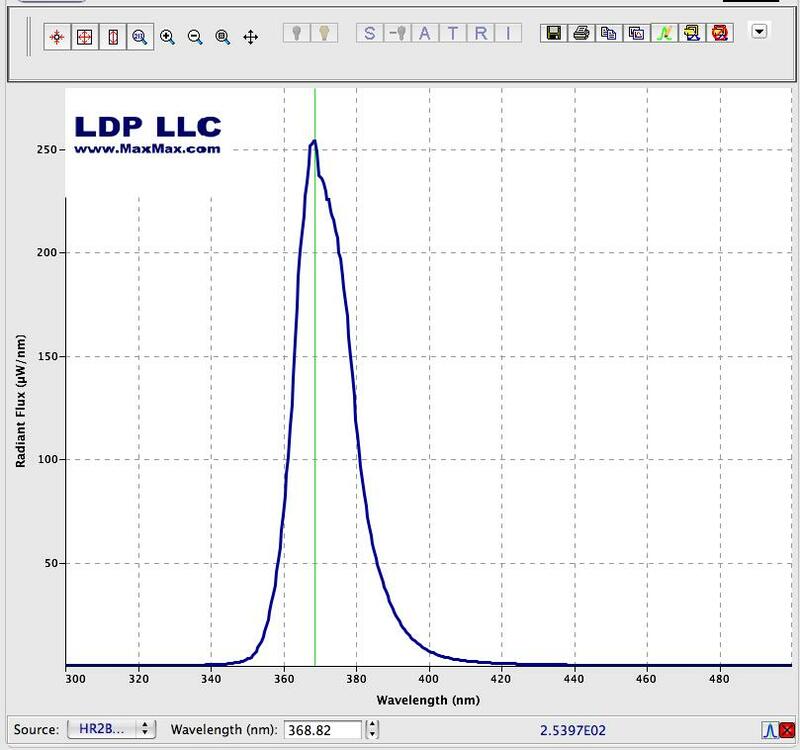 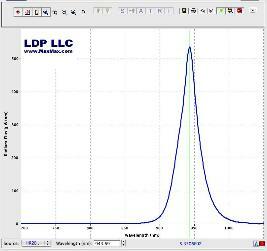 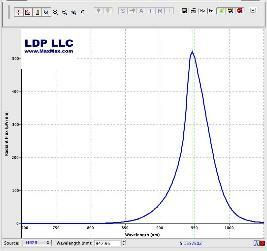 While manufacturer's specifications are useful, we have found that often the actual LED peak frequency is not exactly the same as specified on the manufacturer's datasheet. 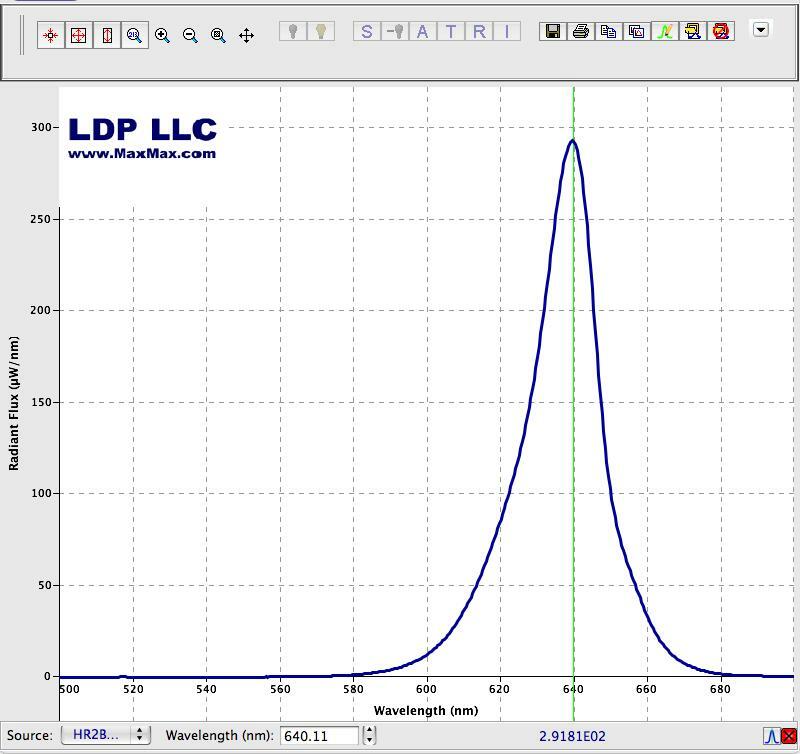 Further complicating the matter is that some LED's output power is stated in millicandelas (mcd) while others use millwatts per radian. 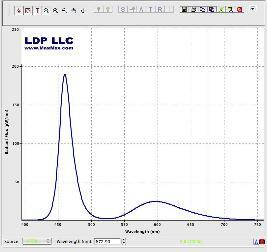 Millicandela measurements are based on candela, candlepower, lux or lumen units. 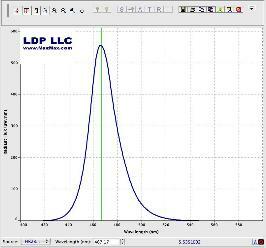 1000 millcandela = 1 candela. 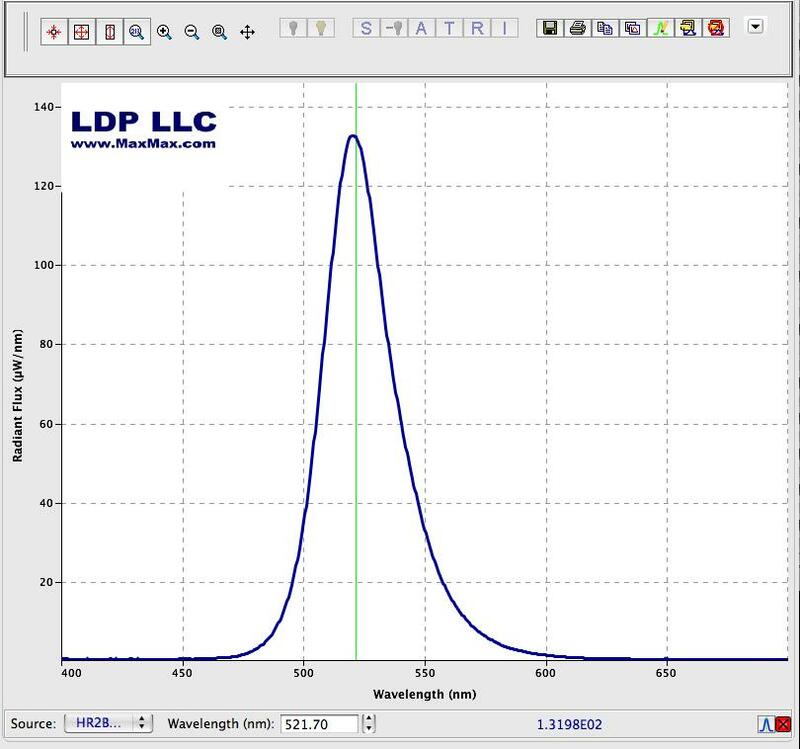 The problem with millicandela type measurements is that the concept is based on how well the human eye sees a particular color (wavelength) and the output power of the light. 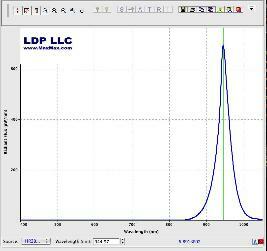 Since the human eye sees green the best, a light with pure green will be easier to see than a red or blue light. 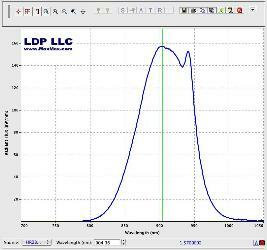 All other things being equal, the green light will have a higher millicandela rating. 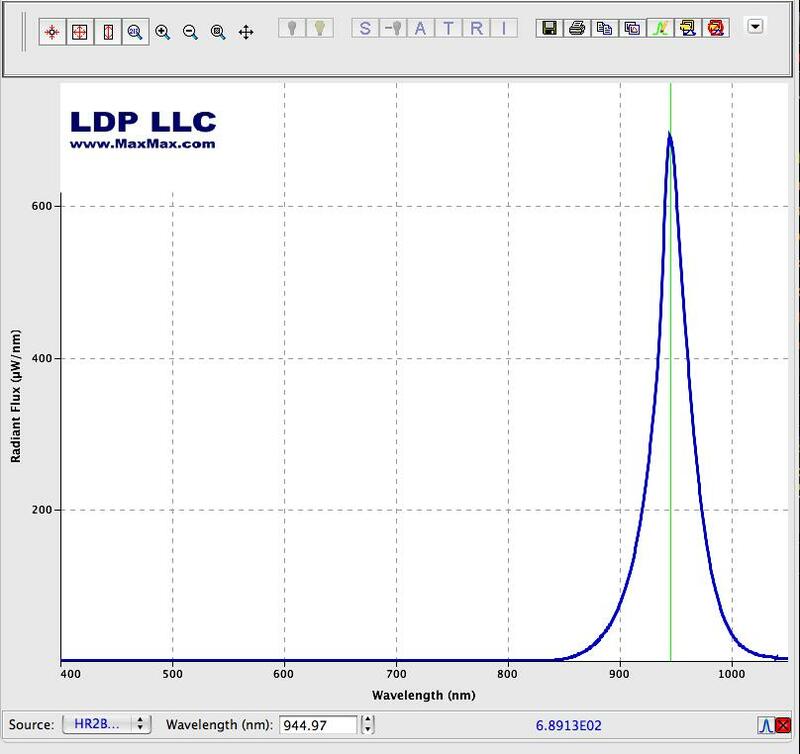 This is why ultraviolet and infrared lights are not measured in millicandelas - their millicandela value would be zero if we can't see the light. 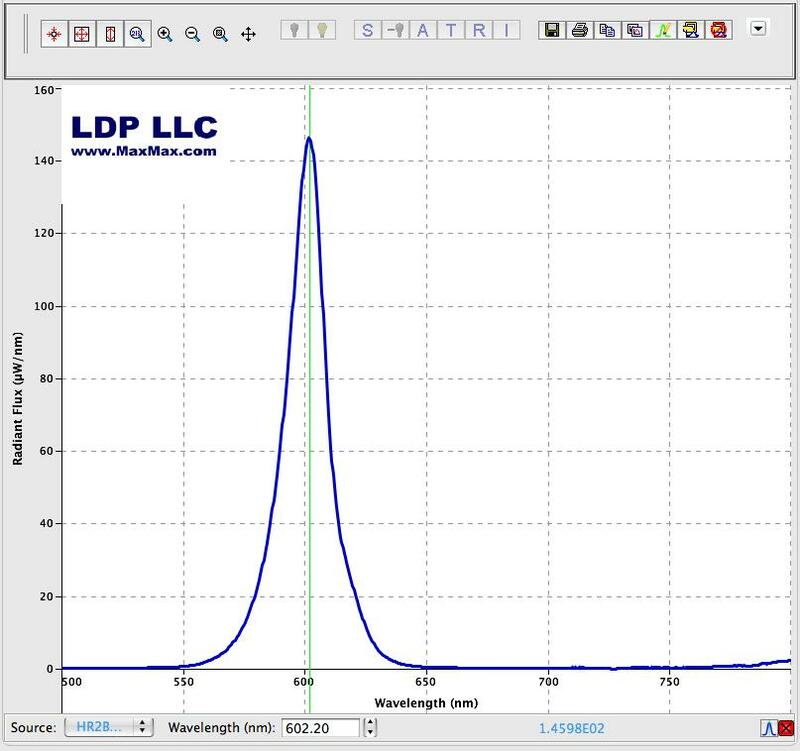 For this reason, we decided to use a uniform system of using the light sources total microwatts (uWatt) of output power using a calibrated light integration sphere and spectrometer. 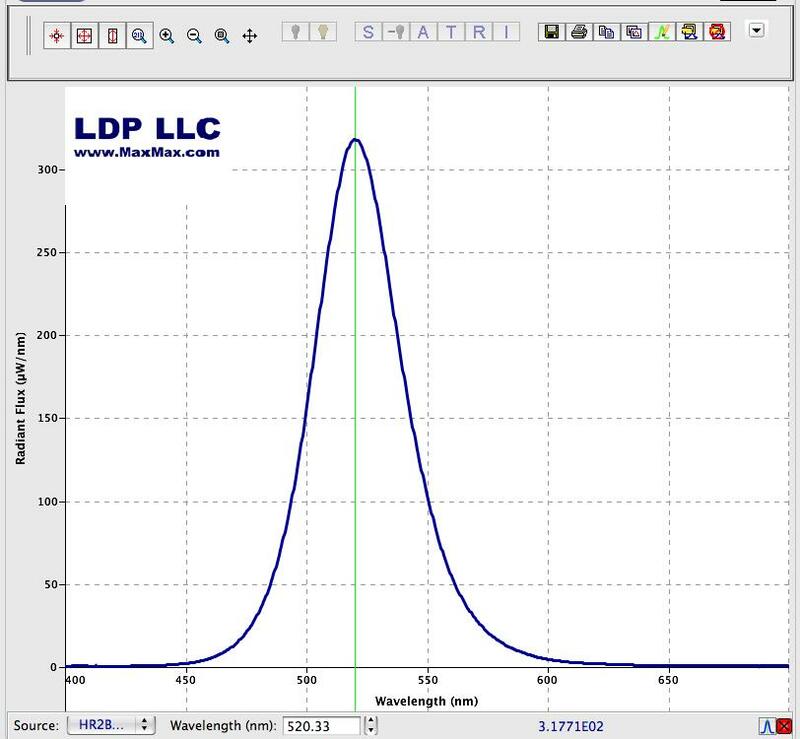 A light integration sphere part of a light measuring apparatus. 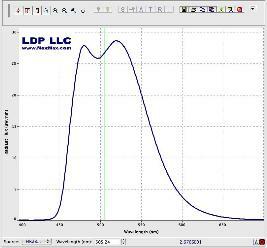 The sphere looks like a hollow ball with a special white coating inside that reflects all light frequencies evenly. 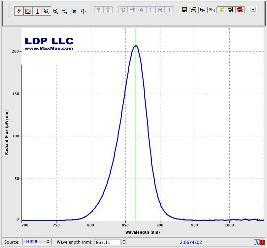 The sphere has two openings. 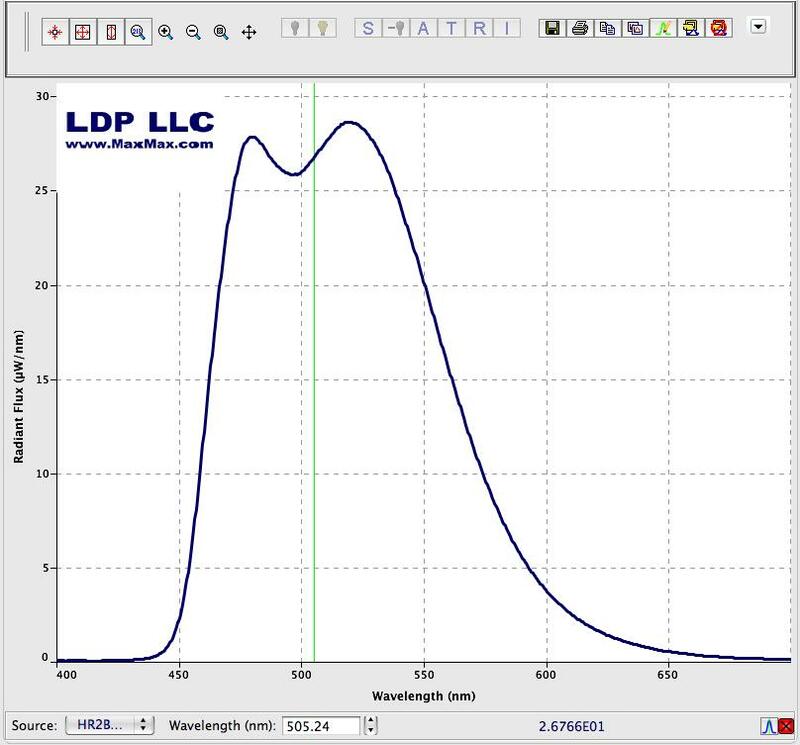 One for a fiber optic cable that is also connected to a spectrometer and the other opening is where you shine the light source. 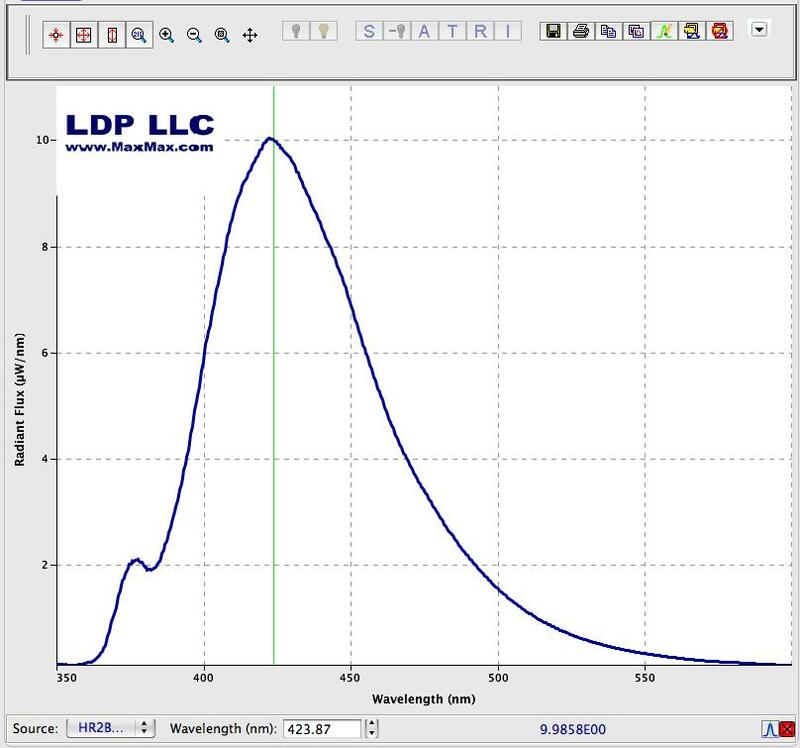 Prior to measuring anything, the sphere, fiber optic cable and spectrometer must be calibrated with a special calibrated light source. 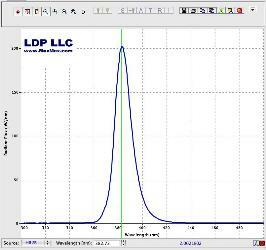 The measurement provides a consistent total output power measurement as well as a graph showing you the spectral distribution of power. 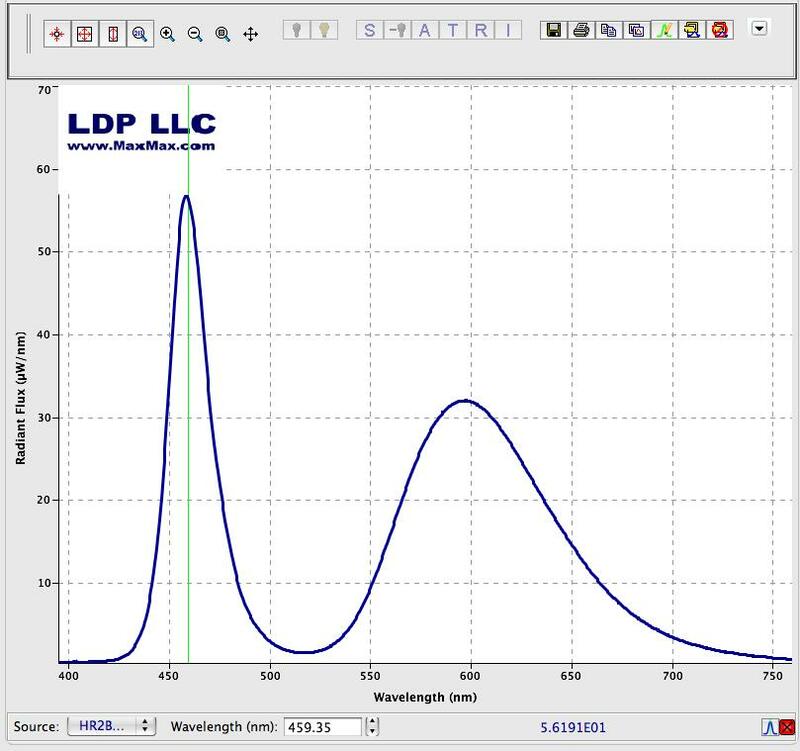 Keep in mind that there is variation between LED's so if you need an exact measurement, you should get a custom spectral measurement made on the particular lights you purchase. 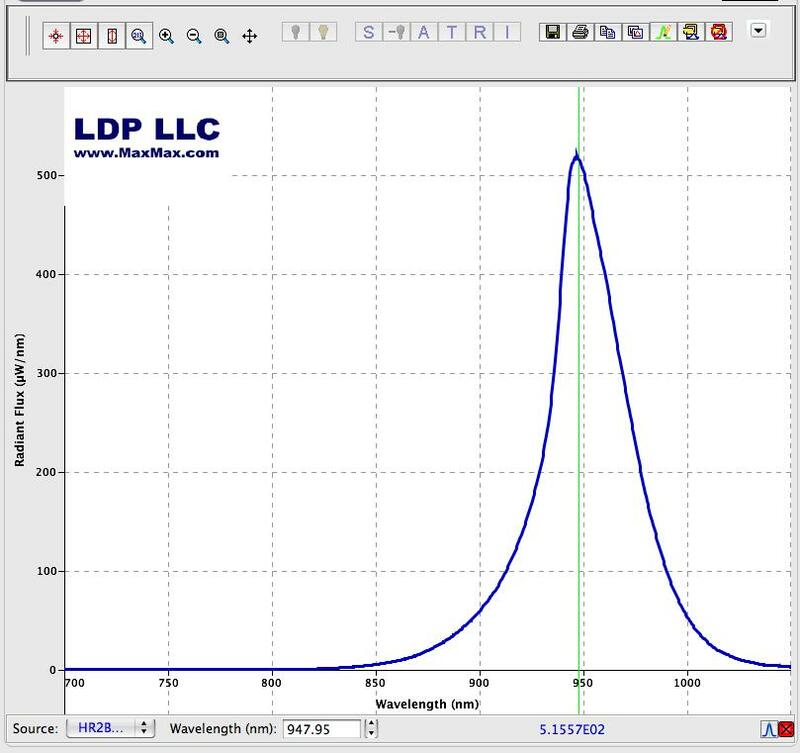 Also, keep in mind that the total energy is a function of microwatts and frequency. A 400nm 10 millwatt light has more energy than a 700nm 10 milliwatt light because the shorter 400nm light waves have more energy. 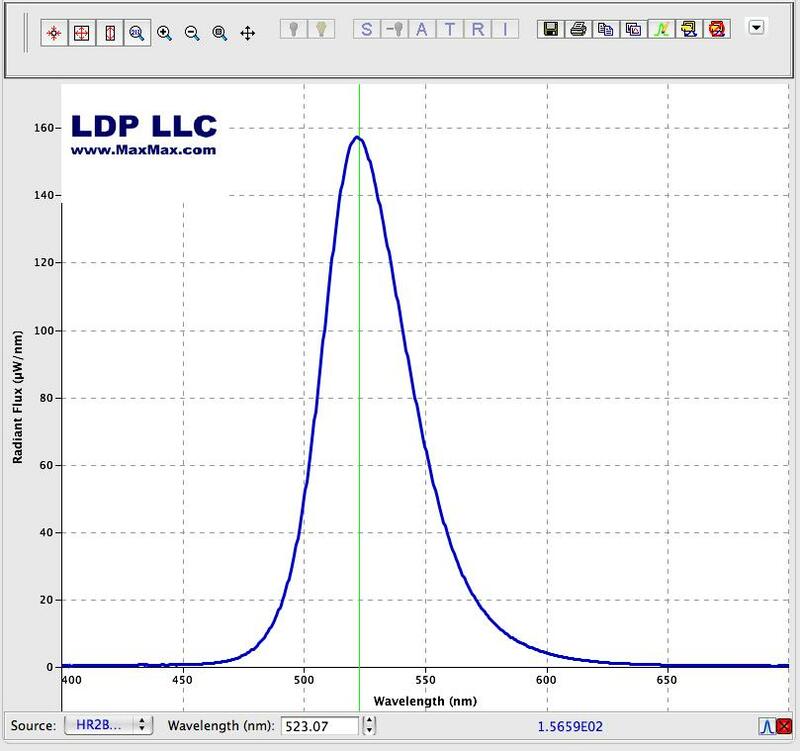 The shorter the wavelength, the high the energy. 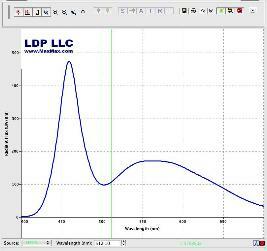 We present the lights in three sections: Ultraviolet, Visible and Infrared. 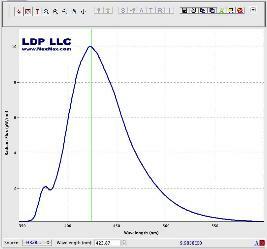 While the human eye can see some UV and in the infrared past 900nm, we can't see well in these ranges. 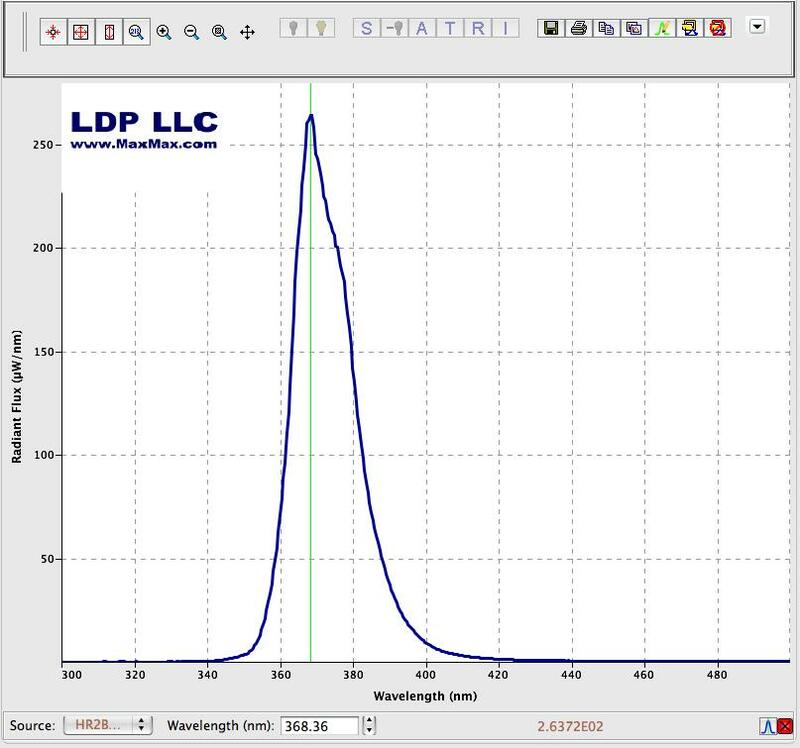 Most people can see a bright 850nm infrared LED as a dull red glow. 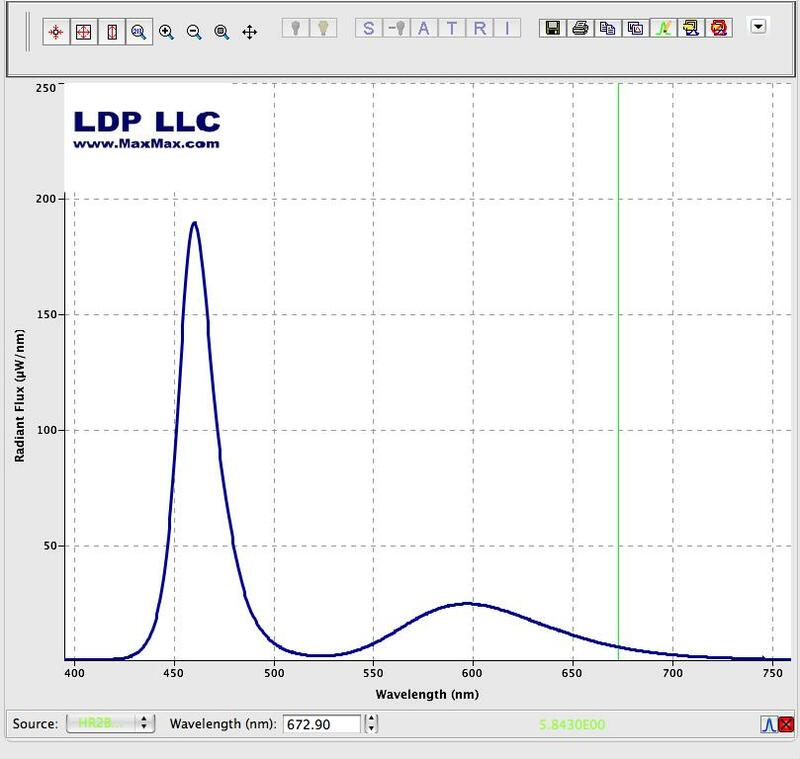 We have performed experiments showing that the 850nm red glow is not a slight emission in the visible red, but is the human eye actually responding to the infrared light source. 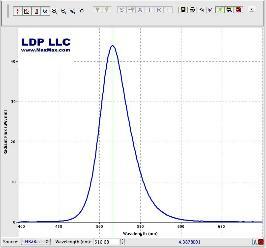 Click on graph for a larger picture.